The Star Teachers programme kicks off with an intensive, centrally delivered, two week introduction to core aspects of the school curriculum: features of effective learning and teaching; how children learn and how teachers facilitate learning; behaviour management; pupil assessment; planning effective learning for all children, including those with special needs (SEND); English as an additional language (EAL); and planning differentiated learning that meets all young learners’ needs. During this time, there will be a focus on developing the trainee group, sharing and disseminating practice together, collaboration and teamwork in learning, planning and teaching. You will undertake audits of your skills, experience and knowledge in relation to the course requirements and the Teachers’ Standards. These will be used to build a personalised learning plan that you will update and maintain throughout your programme. Our primary programme is structured to offer training across the full 5-11 age range with two placements ensuring teaching experience in both KS1 and KS2. This combination of placements allows you to train within Key Stage 1 and either upper or lower Key Stage 2, in two contrasting schools. In recognition of the fact that certain teaching approaches must be secured before a teacher can bring about good or better pupil progress as a result of the lessons they deliver, we adopt a graduated approach to ensure the systematic development of our trainees. In Term 1 you will begin to develop the foundations of teaching practice, relating educational theory to classroom practice. The placement will enable you to build your teaching from small group teaching and 1:1 pupil support, through to co-teaching with a teacher and solo teaching of groups. As your skills develop, you will take on increasing responsibility for the classroom planning, teaching and assessment and progress to full class teaching. In Term 2 you will be placed in a contrasting school for a longer and extended experience. You will build upon the basics from your first term and start to develop a deeper understanding of effective pedagogical practice. In Term 3 you will continue in the second placement. During this final phase you will master an extended repertoire of teaching practices that ensure outstanding learning and progress. The extended placement will enable you to see the progress pupils make throughout the two terms and the impact you have had in securing positive outcomes for young people. You will undertake a short placement in a Nursery/ Early Years setting and a second placement in a secondary school to gain Key Stage 3 experience (ages 11-14, school years 7-9). This experience will complement the sessions centered on transition and ensure you fully understand the expectations, curricula, strategies and teaching arrangements in the age group immediately before and after those you are trained to teach. You will gain experience in a Special School to focus on Special Educational Needs and Disabilities (SEND). This will build on learning already undertaken during the centre-based course and develop a keen appreciation of the needs of diverse children and how to support their learning. You will gain experience of working with pupils with English as an Additional Language (EAL) to further enhance your training. 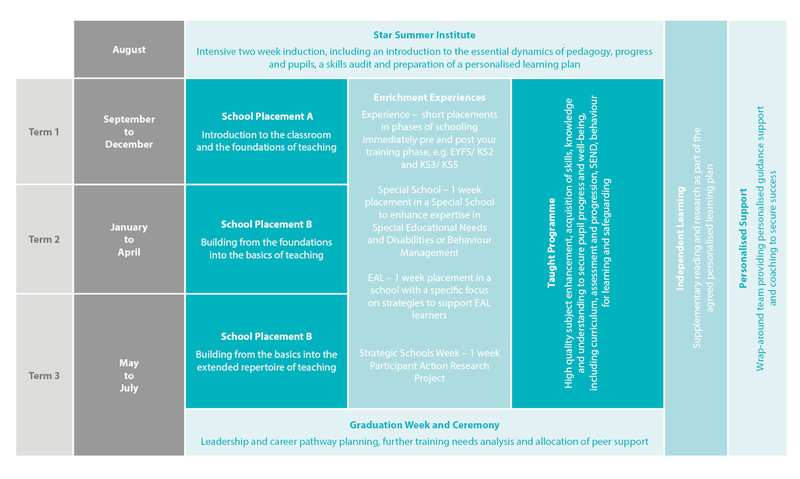 During our Strategic Schools Week, you will lead a small-scale action research project. You will be expected to undertake a project that explores the effectiveness of an aspect of your own teaching and your pupils’ learning. The project will provide an opportunity for critical reflection on both the process and the outcomes and will provide you with an opportunity to better understand, and improve, your teaching practices. During each half term, trainees will be expected to undertake independent study to supplement the taught programme. Throughout the programme, you will benefit from a wrap-around team who will provide personalised guidance support and mentoring to secure your success. In order to gain Qualified Teacher Status (QTS), you will need to demonstrate that you can fully meet each of the Teachers’ Standards by the end of the course. The training programme will operate within a coaching culture where you will maintain a personalised professional development plan and agreed coaching plan to support you throughout the course. This will be designed to meet your needs as a trainee teacher and will focus on what you need to do to become an outstanding teacher and reach the required standards. 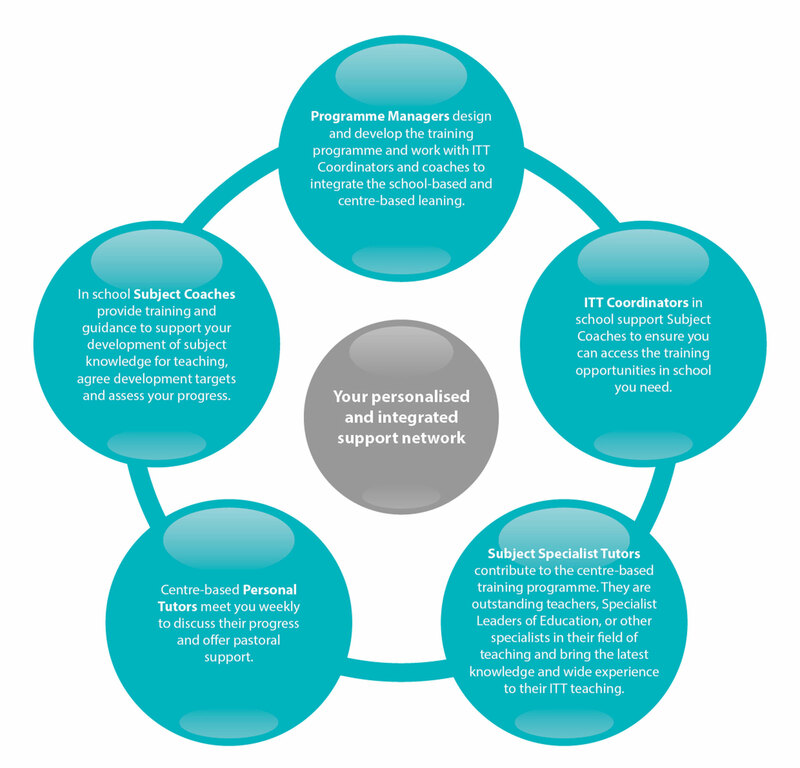 You will take an active part in assessing and promoting your own professional development and you will be supported in this by weekly reviews with your subject specialist and personal tutors at the Centre and with your Subject Coaches in your school. You will be continually assessed through lesson observations and your progress will be formally reviewed at 6 points during the year. Your first assessment will occur at interview. Feedback from the process will identify the immediate areas of development in subject knowledge, experience or skills. A preparatory Reading List will be provided alongside any suggestions for further experience prior to commencement of the course. During the Induction programme, you will audit your subject and curriculum knowledge. These audits, reviewed by our team, will identify your development needs and form the beginning of your Record of Professional Development (RPD). Using the RPD, you will plan and track your progress towards demonstration of the Teachers’ Standards for the award of QTS. You will be formally observed each week by your Subject Coach. These observations and feedback will form the basis of weekly review discussions. Half-termly reviews will focus on work sampling with a view to reviewing marking, homework and their impact on pupil progress. A Personal Development Plan, updated in line with weekly review meetings, will record agreed targets, actions and support needs. You will be required to keep detailed planning notes for your lessons supported by half term plans of overall directions and learning outcomes for your pupils, individually and in groups. If you wish to gain a PGCE, you will be required to complete additional written assignments linking your day-to-day teaching experience to educational theory. In this final week, you will continue to analyse and evaluate your strengths and weaknesses and begin planning your development as NQTs. You will have opportunities to meet with NQTs and RQTs and learn about the continued development opportunities provided through Star Institute. An awards ceremony will mark the beginning of your first steps into the teaching profession.